Once upon a time I would have agreed wholeheartedly with Susan Brown, of Frankston. 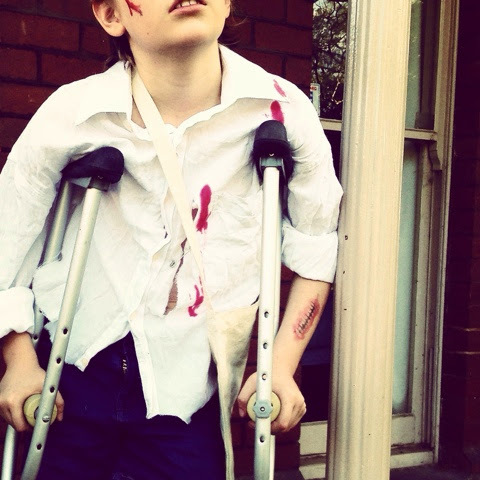 I didn't think Halloween had any place in Melbourne. It certainly was unknown in my childhood (though familiar from TV and movies) and it did seem to me that participating would somehow dilute our 'Australianess'. It was my friend, Bridget, who changed my view. For years she has letter-boxed her neighbourhood prior to Halloween, offering people the option of participating in trick or treating. In this way she has met most of her street and befriended many of her neighbours and they now have Christmas drinks, and street-wide garage sales and ladies nights out. 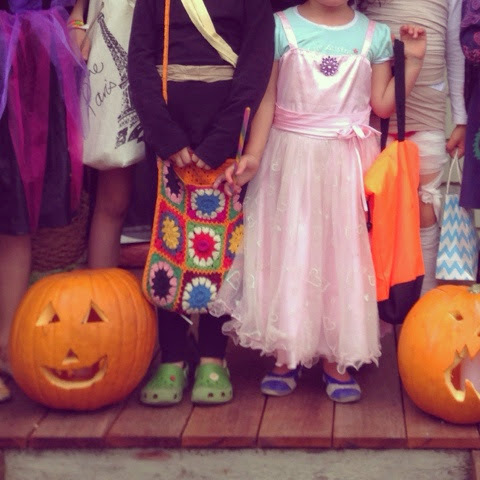 So the last few years the kids have dressed up and we've wandered the neighbourhood - finding more and more houses with a pumpkin, or some cobwebs decorating their hedge each year. The kids have absolutely loved it, and increasingly, so have I. Though it might be an imported event, let's get real - so is Christmas and Easter, and, for goodness sake, the Queen's birthday! Our uniquely Australian celebrations - Australia day (culturally divisive at best) has no traditions other than a day off work and Melbourne Cup day is really a celebration of gambling and getting pissed (not that I'm rejecting the public holiday mind you). I reckon there is room in the calendar for something that focuses on kids, fun, and local neighbourhoods (and fancy dress - who doesn't love fancy dress?). I'm not rapt in the lollies, and it is a bit rich paying $20 for a pumpkin just to carve it up, but Halloween around our neck of the woods is a delight. 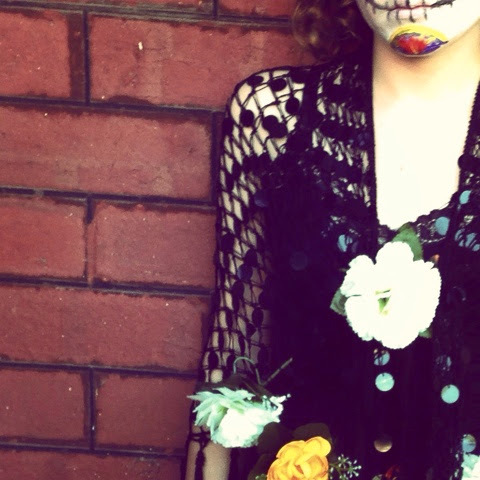 It's getting dressed up and painting faces. It's figuring out how to incorporate Nina's crutches (soccer injury) into her costume. 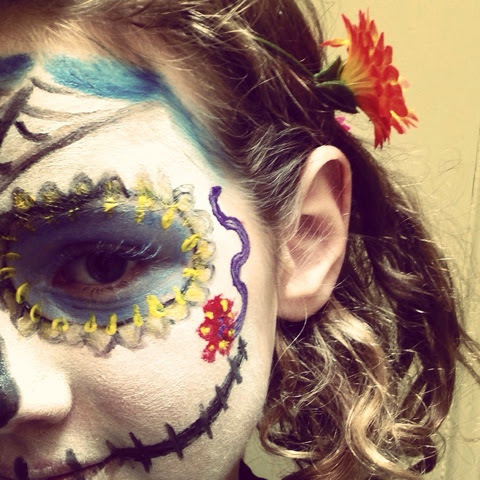 It's seeing Ruby transformed into a teenager, albeit of the skeleton dias de los muertos kind. 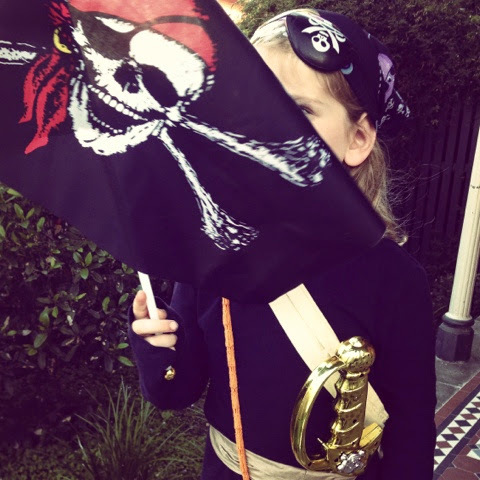 It's groups of kids, with someone's Mum or Dad or both, dressed as pirates and mummies and vampires and princesses, wandering the streets on a balmy evening, running into school friends. It's people having a glass of wine on their front porch while handing out lollies or chocolates, their dogs dressed as dragons, with panniers full of loot to hand out. It's a crowd of adults catching up over a beer at the local pub while their kids plundered the street, in a (mostly) polite and gentle fashion. And it's all over by 7.30. There is a minimum of planning, a minimum of fuss. It's so good to see kids in the streets, feeling confident, feeling like their neighbourhood is a place they belong and a place they can be safe. And maybe it would be nice if we could come up with uniquely Australian thing that incorporated dressing up with wandering the streets - and there'd have to be lollies or the kids wouldn't go for it - but maybe it is uniquely Australian to appropriate everyone else's traditions and refashion them in our own way. So I understand Susan, I really do. But I don't agree. I so agree with this! Have had a bit of a similar discussion on my Facebook feed on this very issue. 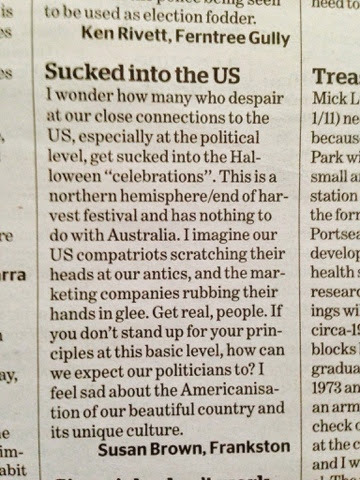 And as an expat American friend said, there is stuff to deplore about Americanisation, like war and McDonalds, but Halloween is, at its best, a community, neighbourhood event, and you don't have to buy the marketing. Our costumes came out of our costume box, our lollies were locally made. It's fun. Who doesn't love a dress up? I think the trick part of trick or treating should be ignored or really benign so as not to antagonise the non-participants, but I think that I'd starting to happen by the way we're learning to only knock at the participating households. Thankyou Julie! You've changed my perspective on Halloween. For the past three years my girl has been obsessed with Halloween and I've been a little more than lacklustre about the whole shebang. Not because of the American thing ( because really we all know Halloween is a centuries old pagan festival originating in Europe) but because I felt a bit weird trick or treating when I didn't really know my neighbourhood and didn't see any others participating. So thank you, next year I will embrace it whole heartedly. Oh Chontelle I so know where you are at. 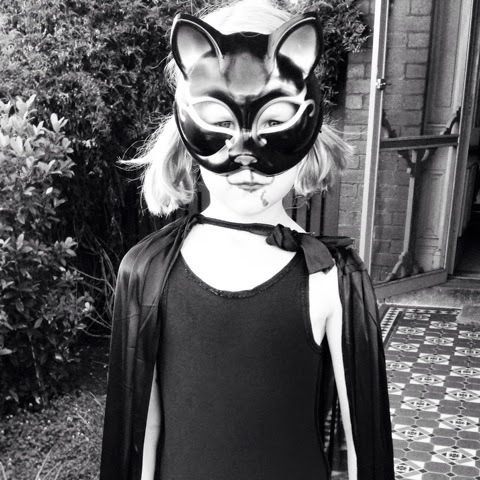 The first year we went trick or treating I felt embarrassed walking down the street where no-one else seemed to be doing it and felt the kid's expectations deflate. But then we hit a street where there were some houses decorated and people standing out the front chatting and it was lovely. And though the candy is a big deal for the kids, just dressing up and being out and about at night is pretty thrilling too.